We’ve known for a very long time that vitamin C is essential to our health, but what many people don’t realize is just how essential it is for beautiful, healthy skin. Vitamin E is usually the vitamin most people think of immediately when thinking about skin health, but, believe it or not, vitamin C is just as important, if not more so! Collagen is a type of protein, one that’s essential for our health. In a way, it’s the glue that holds us together. Collagen is synthesized by our bodies, which means it’s not a protein that we have to eat—we can make it ourselves. However, in order to do so, we need plenty of vitamin C. Collagen is a critical factor when it comes to your skin’s elasticity, softness, and health. While getting vitamin C via your diet or by taking an oral supplement is helpful for overall collagen production, you can do even more to boost your skin’s collagen formation by applying it topically. In fact, it’s believed that topical application is twenty times more effective than taking a supplement. Your body continues to produce collagen throughout your life, but the levels of collagen present in your skin itself declines as the years pass, making treatments like topical vitamin C even more important. The benefits of vitamin C don’t stop there. It’s also a key factor in healing and skin regeneration. There are several different reasons for this, from its supportive role in collagen production to its ability to prevent free radical damage. Vitamin C can even help repair DNA damage in skin cells, which could be one of the reasons that higher vitamin C levels in the skin correlate to a lower risk of skin cancer. Vitamin C is helping to protect your skin from all types of damage, and helping it repair that damage as well. -From aging to UV radiation, it seems like there’s nothing vitamin C can’t help combat. It’s been clinically proven to improve existing fine wrinkles, complexion, and roughness. There are many wonderful whole foods from which you can get your recommended daily allowance of vitamin C. Citrus fruits are closely associated with vitamin C, but it also present in many other fruits and vegetables. -Of course, if your diet is lacking fresh fruits and vegetables, you can also consider taking a supplement. But when it comes to topical application, nothing is better than our VITAL C line. We’ve recognized that a vitamin C antioxidant topical application isn’t going to be one size fits all, not for different people, or even different areas of the face! 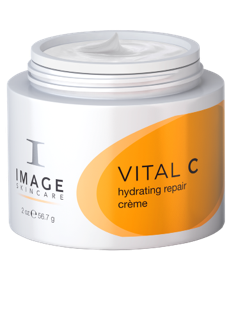 -Our VITAL C Hydrating Eye Recovery Gel, for example, is ideal for those who want to concentrate on fine lines around the eyes, while our VITAL C Hydrating Intense Moisturizer and VITAL C Hydrating Repair Crème offer two options for some serious skin rehab! Regardless of which product in the line you choose, you’ll know that you’re giving your skin the very best, along with a healing dose of a critical nutrient.